Biscuits is a word that I will forever will be learning how to spell. Anyway. I have had some pancake mix for a while now, and I really wanted to make something fun with it (other than just pancakes). I always like to try recipes that you can make with primarily ingredients you have, mostly due to my poor college student status. 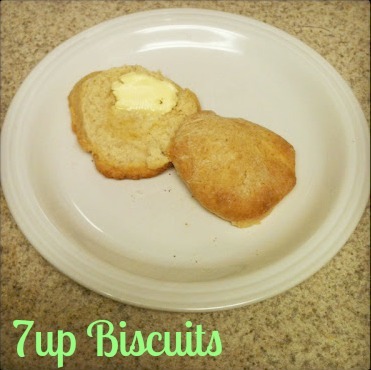 Cut sour cream into your Bisquick mix, then add 7up - it will make a soft dough. Sprinkle your counter with a little Bisquick mix then add dough and pat it out. Melt butter and pour it into a 9" square baking pan. Cut your biscuits up and arrange them in pan on top of melted butter. These biscuits are so good. They have a sweetness and a fluffiness from the 7up, and they are rich from the sour cream. Plus you cant really beat how easy they are to make. Who would have thought this combination of ingredients would make such an awesome treat? I recommend eating them warm with butter, or with some orange marmalade. This recipe sounds awesome!!! I will try it for sure!! !